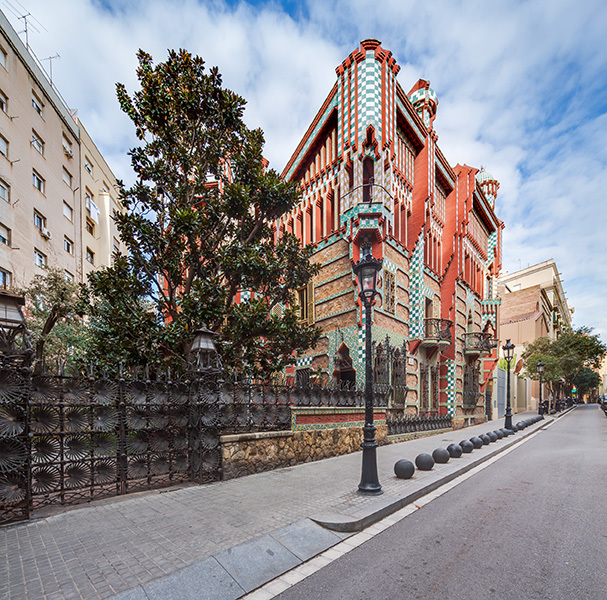 Casa Vicens, Antoni Gaudí’s first building in the Catalonian capital will be opened to public after remaining as a private residence for more than 130 years. It is Gaudí’s first building in Barcelona where he was able to display his enormous talent. Casa Vicens, eighth building in Barcelona listed as a UNESCO World Heritage Site, will open its doors for the public in autumn 2017. Casa Vicens, the first house designed by Antoni Gaudí on his own, was built as a summer home between 1883 and 1885 for Manel Vicens i Montaner, a wealthy Catalonian broker. Antoni Gaudí i Cornet was a Spanish architect from Reus and his works reflect an individualised and distinctive style. A complete rehabilitation and restoration project sponsored by Andorran bank MoraBanc has recovered Gaudi’s structure and transformed a residential building into a museum and cultural site. This house exhibits the architectural concept of Gaudí that is repeated in his other buildings, the materials with their own texture and colour, the passionate colours and fauna. The exterior of the house is an excess of brick and pottery (green and white tiles) because the owner had a quarry that produced these materials and imposed on Gaudí to use them in its construction. The building is an evocation of Mudejar architectural style as well as the forms that are Indian and Japanese in inspiration. This orientalised exoticism was greeted with enthusiasm by the elite classes at the time in Barcelona. Located at the Gracia neighbourhood, this building completes the list of his eight buildings in Barcelona that UNESCO has declared to be of cultural interest along with Sagrada Familia, Casa Batlló, La Pedrera, Park Güell, Palau Güell, Palau de la Música and Hospital Sant Pau. The current restoration aims to recover Gaudi’s original design and to adapt the structure to its new museological project. The rehabilitation and restoration project has been assigned to the architecture studios Martinez Lapeña-Torres Arquitectes S.L.P. and Daw Offive S.L.P., and the project is being executed by joint venture Calaf AMC5. The first phase got underway in April 2015, and full execution began in September 2016, and it is scheduled to finish in autumn of 2017. The main goal of the museology proposal for Casa Vicens is to recover and showcase the original house as designed by Antoni Gaudí between 1883 and 1885 while adapting the facilities to its new use as a museum and a cultural site. The spaces designed by Serra de Martínez will be used to serve visitors and will complement the tour of the entire house. The ground floor will house the visitor welcome area, while the spaces on the first and second floors will be set up to house the permanent exhibition halls displaying information about the building, along with temporary exhibitions and activities related to the museological project. This 1925 enlargement allows resolving the building’s accessibility. The circulation through the building will be organised with the construction of a new staircase which restores the original one from the single-family home that disappeared with the enlargement. A lift up to the roof has also been installed to connect all the floors in the building. The basement of both the original building and the enlargement – spaces that have been transformed over time will house the bookshop and shop. The different facilities (electricity, heating and air conditioning, data) that is required for the new facility to operate, as well as restrooms and other areas for internal use will also be located in the basement. Finally, the café will be located at the end of the garden. This project is framed within conscious reflection on tourism policies in Barcelona. It is indeed a responsible and sustainable cultural project in constant dialogue with different public administrations. Since 2017 has been named International Year of Sustainable Tourism by the United Nations, in fact, Casa Vicens is currently working with the District of Gràcia and Department of Tourism of Barcelona Town Hall to develop a Tourist Impact Plan of Casa Vicens on its neighbourhood.